You have the option of assigning a color to each of your documents. This color is then used in all tables and visualizations, including in MAXMaps. For example, you can use color attributes to indicate the processing status of a document or to make other features, such as the interviewer or the location, visible. To assign a color, right-click on the document and select Color from the context menu that appears. Click on one of the standard colors it will be displayed on the document symbol. Click the icons to the right of the color squares to select your own colors. 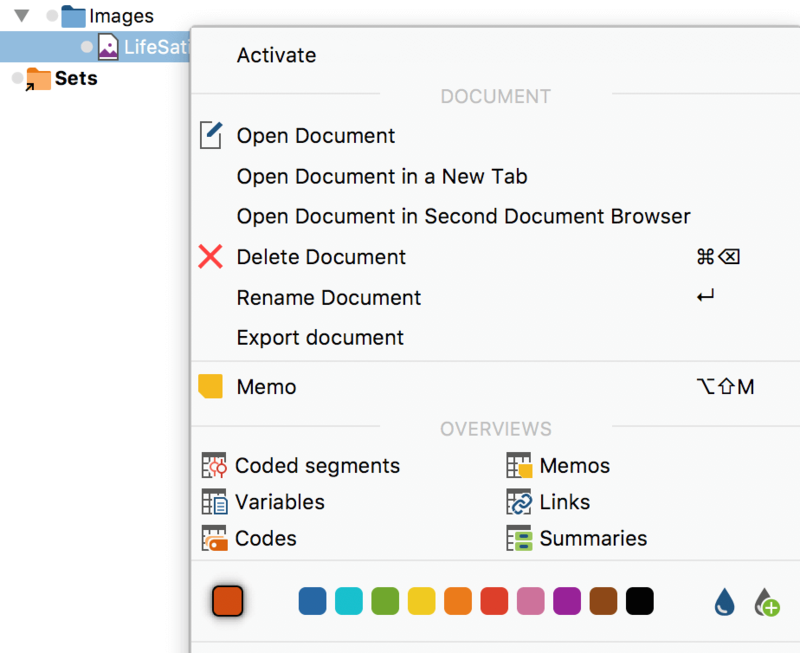 The color attributes of the documents are listed by default in the first column of the “Data editor for document variables” and the “Document overview”. Since each column can be used as a sorting criterion, overviews can also be sorted according to color. Documents with the same color will then be listed one after the other regardless of the document group to which they are assigned.